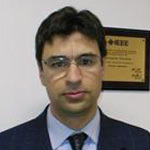 Lorenzo Peretto (M’98-SM’03) is Associate Professor of Electrical and Electronic Measurements at the University of Bologna, Italy. He is Chairman of the TC-39 of the Instrumentation and Measurement Society “Measurements in Power Systems”, IEC representative in the Joint Committee for Guides in Metrology “Expression of Uncertainty in Measurement”, General Co-chair of the “Applied Measurement for Power System” (AMPS) workshops. His main fields of research are distributed measurement instrumentation and measurement methods of electrical quantities. He is co-inventor of 16 patents and author and co-author of more than 180 scientific papers.